You guys may be confusing me with another vendor, I was not at the Springfield show this year and I do not offer painted models or the F40PH's, nor have I ever displayed a K car as the model is only under consideration at this point. Adams_Umass_Boston wrote: I received my Blue line 600's yesterday. They are great, I am just waiting on the decals that are coming out this month. I am happy to hear that you liked the 0600's Robert, the 0700's will have etched brass parts for the roofwalks, end gates, and fan, to make for a nicer model. The decals shipped yesterday from Microscale, should be here in a few days. A little pricey but nice looking. 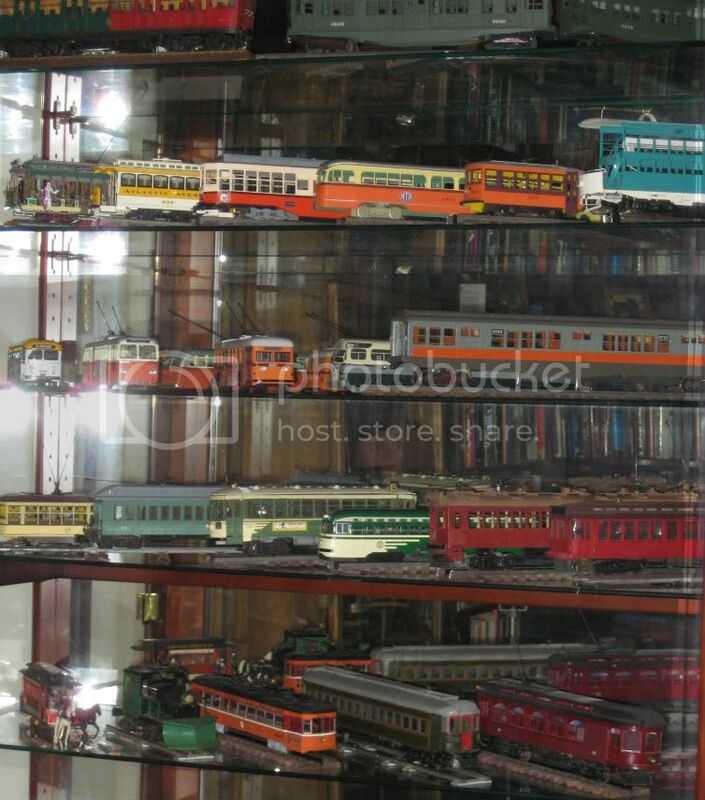 I was considering an HO layout based on the Green Line but as it was back in the '60's when the PCC's reigned. Besides these pic windows I was thinking of kitbashing a Bowser or Bachmann PCC into an all electric car (3197-3221) since all you would have to do is add the roof monitor thingy. Another possibility is a picture window by enlarging the windows. Also would have to add the left hand door using another body shell. Currently all these thoughts are on hold as (1) I will probably be moving and (2) I have gotten into "virtual modeling" on MS Train Simulator and am working on a 1960's Cambridge Dorchester line route. jetfan wrote: I am happy to hear that you liked the 0600's Robert, the 0700's will have etched brass parts for the roofwalks, end gates, and fan, to make for a nicer model. The decals shipped yesterday from Microscale, should be here in a few days. For me, I am an OK model builder. I don't feel that I'm good enough to tackle this project yet. I figured it was better to buy them now and when I'm more confident with myself and build better skills I can continue. I want these to look perfect and I am willing to wait. Plus I want to power the set and i have no idea how to do that. I want to power the set and i have no idea how to do that. We will have a frame to accept the Bowser mechanism in the future, the drawings were sent out and now it's the usual waiting game, I'm hoping to have them next month sometime, but I'm at my suppliers mercy. Has anyone else ordered the K cars in N scale? I'm going to be placing a substantial order, probably at least 10 cars or so minimum because I have two F40PH's to pull consists. diburning wrote: It's an unpainted shell and unpowered chassis. You buy a Bowser drive to power it and you have to paint it yourself. you want working couplers? go to www.customtraxx.com george huckaby has them on his website. i use them and they are great. you have to fasion your own drawbars, and for those of you modelling mbta subway cars give a nice shout out to joe from island model works for finally putting boston subway cars on the map in ho scale......anybody living in boston that appreciate boston transit will be happy to see these models too. I was wondering of any of you guys here in the MBTA community and commuters who do scale modeling of any MBTA stuff in general? Subways, commuter rail, light rail, etc.? So far I know me, Diburning and Adam_UMass are into MBTA modeling. I recall 3rdRail / Paul might be into MBTA modeling too? yup add me too i lve in boston and work on the mbta. Hi Veristek ! I am into modelling Boston equipment, however, I'm into "O" and tend towards the older equipment. My dream model would be an "O" No. 1/2 East Boston Tunnel Car, Wason Main Line Car, 01100 P/S Main Line car, MBTA All-Electric PCC, or any trackless. My Boston collection currently has 14 cars; , No. 5 Main Line ACF set, 0700 Cambridge Tunnel car, BERy "Birney", Type 5 BERy car, Type 4 BERy car, 20' closed WEStRy car, MTA Center Entrance, "Queen Mary" PCC, Picture Window PCC, Ford MTA bus, 1951 MTA Pullman Trackless, 1936 BERy Pullman Trackless, BRB&L Electrified Coach. Some are off the shelf, some I've built from kits, some I've "kit bashed". Thanks for thinking about me. Do you have any pictures on-line of your models? Whoa, Paul! There's some good-looking stuff there! Some day when you're bored with not much to do, how about getting some individual shots? Thanks. That stuff represents a culmination of about 38 years of fiddling with traction models, but yes, what I plan to do is to some day photograph them on my layout for backdrop. Most of the pieces are not motorized, however they're on Wagner Trucks, the "Holy Grail" of "O" traction trucks now. The only two that are motorized might as well not be as I run a 3-rail "O" layout and they have 2-rail motors. The backdrop would be nice however. The Center-Entrance car is wearing actual MBTA "tangerine paint" that was tossed, about to hit the dumpster, at a shop in a gallon paint can with about 4 ounces left, back in the 70's. I asked permission and scooped it. So, if there's any question what "Tangerine" looks like, there it is ! 3rdrail wrote: ...The Center-Entrance car is wearing actual MBTA "tangerine paint" that was tossed, about to hit the dumpster, at a shop in a gallon paint can with about 4 ounces left, back in the 70's. I asked permission and scooped it. So, if there's any question what "Tangerine" looks like, there it is ! No wonder it looks so good! That would be my pick for the first to photograph!